Click on the photo to enlarge for the full panorama! This dragonfly was so large I didn’t even need my macro lens to capture it full frame! This is a female Widow Skimmer dragonfly (Libellula luctosa). Learn the differences between a dragonfly and a damselfly here. 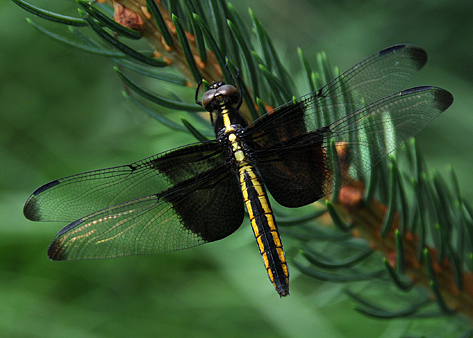 There are approximately 5,000 named dragonfly species in the world. In North America, there are about 450 species, making them (a little) easier to identify. They hail from every continent except Antarctica, with life span ranges from about six months to several years. They don’t bite or sting and are considered beneficial insects because they eat harmful insects such as mosquitoes, gnats, ants, and termites. They’re fast (30-60 miles per hour), move in all directions like a helicopter (including hovering), and their eyesight is amazing—each eye contains up to 30,000 tiny lenses. The largest dragonfly recorded from fossil records had a wing span of about two and one-half feet. It was a prehistoric insect from 300 million years ago. Read more about it here on Wikipedia and on this blog– The World We Don’t Live In. I definitely wouldn’t need a macro lens to record that! See another dragonfly I photographed at the Brooklyn Botanical Garden here. My friend Tom took us out to his farm in Orange County, Virginia, this morning. Tom and Michael commenced to mowing about an acre of grass (more or less) while I went exploring. This tiny white-as-snow spider stood out in a field of grass and I tried photographing her despite the swaying grass. The first thing I noticed was the big white posterior. Every time I moved in to focus, she did this crab-like sideways dance for several shots. Then another bug flew onto the same grass stalk and was instantly caught. It was already a goner before I realized what had happened (even spiders have to eat). Of all the grasses springing from Tom’s 280 acres, this one unfortunate bug wandered onto this one blade, and the rest is history. 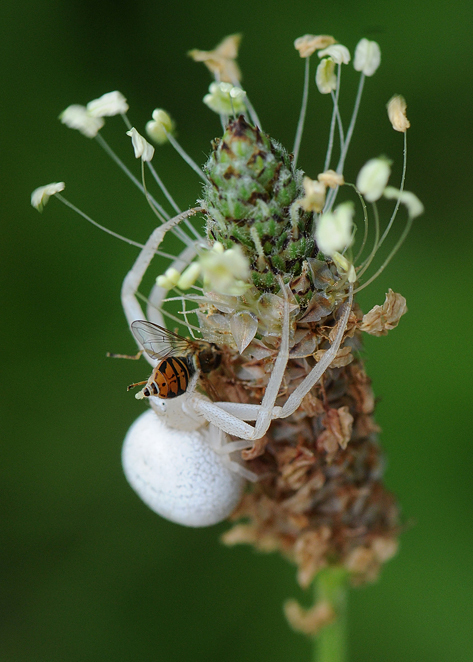 This is a female ‘Misumena vatia’ spider—also known as a “white death spider,” “flower crab spider,” or “goldenrod crab spider.” For some really fascinating information about how this spider can change colors, click here or here. These spiders sometimes aim for prey much larger than they are, as evidenced here. And for some really nice images of one on a cosmos flower, click here. For detailed information on this spider, click here. I thought the prey looked awfully familiar. A “Hoverfly” made its appearance on a posting I made in May. Click here for the story and photographs. THIS JUST IN…Tom, said proprietor of Springbook Farm, has informed me that the plant is a Buckhorn plantain flower head (Plantago lanceolata). Mist! And lots of it. I was weeding the garden this morning and decided to water it as well. After watering with the dial on “shower,” I changed it to “mist” and noticed these beautiful droplets forming on the Balloon flowers! I don’t know why I don’t think about doing that when I’m out photographing flowers. I usually just wait for Mother Nature to set the scene up for me. About two hours later, we had a thunderstorm. It figures. The backyard needs watering—I’ll go wash the car now. I’m sure it will rain immediately after. 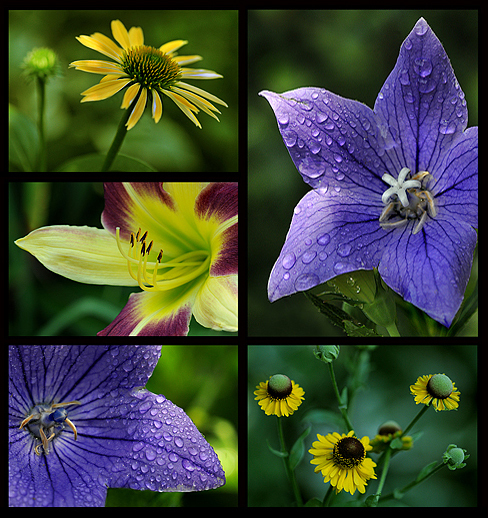 See more Platycodon photos here. Dharma & Kobie (and their mom, Kayla) stopped to admire the front yard garden today and chat with me while I photographed bees swarming on the globe thistle, coneflowers, and butterfly bushes. I got these quick shots of these sweet dogs before they led Kayla off to continue their evening walk. What cuties! © Cindy Dyer. All rights reserved. See other pet portraits here. The July/August 2008 issue of Hearing Loss Magazine will feature Alexa Vasiliadis, a high school student and dancer from Virginia. I first blogged about Alexa here after I photographed her in a performance of The Nutcracker. In early May I photographed her at a dance studio and posted those images here and here. Images from both shoots were used in the feature layout of the magazine. Below is the cover and the opening page of the article on Alexa. See more of my garden blooms here, here, and here. © 2007-2019. All written content and photographs on this blog are the property of Cindy Dyer. You may link to the site but written content and photographs may not be used without my written permission. Thank you!